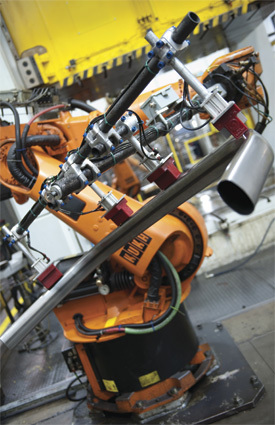 High-payload robots tend to the Schuler hydroforming operation. Because robot performance depends on the weight (and weight distribution) being cantilevered, the use of carbon-fiber material leads to increased speeds and quicker settling times within the working envelope of the robots, promising throughput gains. Schuler Inc., Canton, MI, not only offers innovative metalforming systems and technology, but also performs production hydroforming. The firm supplies hydroformed components used in an array of applications, including automotive, heavy truck, ATVs, motorcycles, appliances and office furniture. Part size ranges from tubes 1- to 6-in. dia. with wall thickness from 1.4 to 8 mm. Initially established as a hydroforming-technology proving ground, the Canton facility has evolved to take on full commercial hydroforming production. It operates a press line comprising a Schuler 500-ton hydraulic preform press and an 8500-ton hydroforming press. The line is tended by five high-payload robots—model KR150 robots from Kuka Robotics Corp., Clinton Township, MI. The robots are particularly well-suited for transfer and load/unload tasks, allowing Schuler to support the design and manufacture of prototypes as well as high-volume production. Prior to 2005, all of the robots’ end-of-arm tooling used at Schuler for part handling was constructed by outside suppliers. This approach proved costly and still resulted in some reconfiguration and tuning at die tryout, according to Schuler plant manager Craig Zeleji. The firm then decided to try its hand at building end-effector tooling inhouse. It developed a design based on readily available, interchangeable components using standard 2.5-in.-dia. tubular aluminum for the main boom. Extension arms, designed to hold clamps and magnetic grippers, were fabricated from 1-in.-dia. aluminum tube. While attending an industry trade-show in 2006, Zeleji spied an alternative tooling solution: carbon-fiber tooling (from German supplier Bilsing Auto-mation, also in Clinton Township, MI). The tooling was designed to replace traditional aluminum products. What piqued Zeleji’s interest was the potential benefits associated with tooling constructed from high-modulus, lightweight graphite carbon fiber. Zeleji set out to evaluate the carbon-fiber tooling on a Chrysler production-hydroformed component for an engine cradle, weighing about 20 lb. At the time, the baseline tooling being used in production at Schuler was constructed of aluminum, with a rotation device mounted on the leading edge of the end effector. The tool handled two blanks—it picked and placed one blank for cleaning and lubrication, and placed a second blank, following lubrication, into the die cavity. Schuler designed the process with a two-cavity die, although the robot could only load one component at a time due to the combined weight of the parts and the end effector. The weight of the tooling limited robot efficiency and made tool changes cumbersome. Further, the weld joint at the end-effector pivot point became susceptible to cracks. How does this benefit press-tending applications? Consider, for example, a recent Bilsing customer that had designed a large steel end effector required to carry a 2700-lb. load. The frame itself weighed more than 615 lb. Altogether, the weight of the part, end effector and tooling exceeded the capacity of the robot. A redesign of the end effector using carbon fiber reduced the weight of the end effector by 500 lb., resulting in a 114-lb. tool and bringing the total weight within the robot’s capacity limitations. Additionally, carbon fiber can help to extend the service life of robots simply due to the harmonics. Carbon fiber absorbs vibration rather than transferring it to the robot, where it wears on joints and other components. Carbon-fiber tools also cease to bounce or shake almost immediately after settling into position, reducing or eliminating the need for clamping devices used to prevent bounce and shake associated with aluminum end effectors. Carbon-fiber tooling addressed these problems by providing a lighter, stiffer alternative. Because robot performance depends on the weight (and weight distribution) being cantilevered, the use of carbon-fiber material leads to increased speeds and quicker settling times within the working envelope of the robots, promising throughput gains. When Zeleji began working with Bilsing, Schuler already had designed the tooling for a complete solution, from the part back to the robot’s wrist. Conforming to standard interchangeable sizes, Bilsing’s carbon fiber was relatively simple to integrate into the end effectors. Use of carbon fiber not only allowed the engineers to manufacture tooling in the same diameters, but it offered significant strength and stiffness advantages over aluminum. To achieve the same strength of carbon fiber, Schuler would have had to double the wall thickness of the aluminum tubing—and still would not realize the high stiffness properties of carbon fiber. In spite of the misconceptions surrounding carbon fiber, the benefits of developing a lighter, stiffer and more harmonically stable tool was a challenge that Schuler could not afford to overlook. The value proposition of using carbon fiber over aluminum or steel is justified in the design and construction of stamping and body-shop end tooling, particularly in high-speed robotic applications. Article provided by Bilsing Automation: www.bilsing-automation.com; 586/463-0686.